If you’re single and reading this, chances are you’ve probably dabbled in some online dating. It isn’t anything to be ashamed of - tech has fast become a widely accepted way of connecting singles looking for love. Looking for your happy ever after isn’t always sweetness and light though. Online dating could open tech-savvy singletons up to a dark side of dating. More people than ever are meeting men and women they’ve only ever communicated with online. This means that being catfished - talking to a fake profile - or even having your identity stolen by a potential digital love interest are very real dangers. But dating should be fun, whether it’s in a bar, club or online and with a few nuggets of know how, savvy online dating is an absolute reality, whether you’re gay, straight, or anything around or in between. The first line of defense is the dating service you plan on using. If you’re thinking about apps, but aren’t sure which to try, check out our best dating apps round-up, featuring a selection of our favorites. If you’re someone who likes the idea of longer, more considered messaging, websites might win for you. Some services like OkCupid feature both a website and app support, covering all the bases. Many dating sites and apps will have their own safety policies or tips outlined in small print. Some will even have advanced moderation. For example, Chappy, the recently launched gay dating app currently getting behind the hashtag #dontbeadick, has 500 moderators policing the service for profiles that don’t meet its requirements. Other services like Guardian Soulmates, a global dating website which was in the news after a data breach in early 2017, features tips onsite and link-outs to ODA - the Online Dating Association. The ODA is an online dating goldmine. On its website, you can find plenty of videos and some sage advice to help you flag the telltale signs you’re being taken for a [bad] ride. Whether you match on Tinder, are messaged on Bumble or get tapped on Grindr, a heart flutter can quickly make way for an empty sinking feeling when you realise you’re talking to a fraud. This happens a lot, especially with services that don’t require profiles be linked to a social media account. 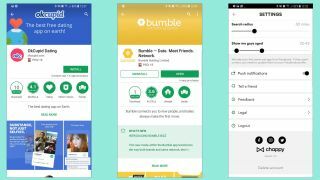 Using apps like Tinder, Bumble and Chappy are a great start. These verify your identity with either a number or a Facebook profile, sifting through a layer of scam daters. Admittedly, it's not the most cutting edge security, but it’s a layer of protection. If you’re already thumb deep in witty repartee with your touch screen tease, but can’t shake the thought that there’s something fishy going on, there are a few other ways of verifying his or her identity. Facebook is the easiest. Depending on your online love interest’s security settings, using a name or number in Facebook’s search bar will very likely pull up their Facebook profile. If it does, excellent - you’re talking to a real human being. Going a step beyond Facebook searching and dipping your toes into the murky world of cyberstalking could be a necessary step if Facebook fails you. Very few people don’t have an online identity. If his name is John Doe and he’s an architect in London for example - typing the words “John Doe, Architect, London” will very likely pull up a LinkedIn or Twitter profile. If the information is publically available, then you can use it to swiftly verify that the person is real, using only details that they're already openly sharing. Just don't go digging for details that they're not making public – that's not cool. FaceTime or Skype can be a great way of verifying a potential love interest's identity. Bear in mind, teachers, spies and privacy savvy users will unlikely have an easy to trace online fingerprint. In turn, the methods mentioned are just initial guidelines. The best thing you can do to verify a person’s identity initially is Skype or Facetime. Nothing saucy, just a quick identity check - though of course, flirting is definitely allowed. If your love interest refuses and also isn’t up for meeting after a few weeks however, alarm bells should definitely be ringing. Most smartphones have GPS receivers, so can accurately pinpoint your location. Even smarter is the fact that apps like Glympse and even WhatsApp allow you to share your location with a contact for a set period of time. Fire one of these services up as soon as you meet your date, share your location with a trusted friend and they can keep tabs on your whereabouts with little more than a glance at their smartphone. WhatsApp and Glympse both offer location sharing for a set period of time. A point to note, using your GPS will drain your battery a bit faster, so make sure you’re at 100% before you leave for your date. In addition, pick a venue that isn’t underground. This will give your phone the best chance of sending your accurate location - and if a problem does arise, your friend can locate you to within a few meters. Need an excuse to leave? Whether there’s no chemistry or your spidey sense is tingling and your date doesn’t seem like such a safe bet, provided you’re meeting in public, a solid excuse to leave will enable a speedy departure. Fake call apps for iOS and Android could get you out of an awkward fix with a bad date. While you could go old school and request your friend call to check up on you and potentially, enable an early exit, it’s much easier to install a Fake Call application. Available on iOS and Android, you can set one of these apps to ‘call’ at 9pm, step out to take it and return to your date with a polite but firm ‘I have to go’. If it’s a hook-up you’re after or your date has taken an intimate turn, then staying safe is a bit, harder, as you sacrifice the protection a public environment provides. That said, there are still measures you can take to keep connected to a trusted friend in addition to those outlined above. If you have a wearable, whether it’s an Android Wear, Tizen-powered Samsung Gear S3 or an Apple Watch, you could still have a line of defence on your wrist. These smartwatch operating systems all offer applications that can either call an SOS contact with a couple of subtle taps or the police should trouble arise. Emergency services will be able to triangulate the location of your phone, so should be able to find you sharpish. Using your wearable could be the best way for you to get in touch with loved ones or emergency services when your smartphone isn't on hand. It goes without saying - your phone needs to be connected to your wearable, so keep it switched on and full of power - a portable battery pack is an excellent idea for sleepovers. Alternatively, a smartwatch like the Huawei Watch 2 or the Apple Watch 3, both of which have built-in cellular services, can operate independently of a smartphone so will be active even if your mobile runs out of juice. A few weeks in, four or five dates down, you’re feeling safe in the knowledge that you’ve made it past the online dating gauntlet – and rightly so – this stuff isn’t easy! That said, even when things seem to be going well, there are a few signs you might want to keep a look out for in the back of your mind, just incase. For starters - have you swapped social media account details? It doesn’t have to be Facebook friending levels of digital intimacy, but knowing one another’s Instagram or Twitter account names just gives you a loose insight into one another’s friendship circles and verifies a person’s history. Keeping your phone pin private and not being too trusting too early with digital information also helps protect against the really scary stuff like identity theft. It’s all about trust at the end of the day, so the sooner you can find that with your online love interest, the better. After all, whether you stay single or end up coupled, staying safe is a requisite to finding your happy ever after. For a full list of our favourite dating apps for every orientation, check out our best dating apps round-up so you can take an informed leap into the world of digital dating. Check out our best dating apps round-up so you can take an informed leap into the world of digital dating.